The woman pictured above, accused of being a kidnapper was humiliated by an angry crowd after she was reportedly caught trying to steal a new born baby in Anambra state. The incident caused a huge scene in Okpoko, Onitsha area of the state, after the alleged kidnapper was nabbed by the residents while ‘trying to kidnap a baby from a teenage girl’. It was reported that the lady claimed she had discussed and agreed with the teenager who gave birth out of wedlock that she will buy the baby from her. The lady said the agreement was made when the girl was 7 months pregnant. 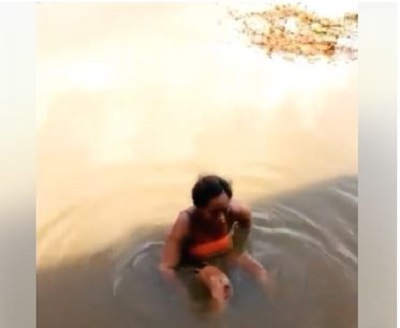 The angry residents who didn’t believe her story, later handed her to the authorities after forcing her to roll in a muddy water.